The Bounce technology in the midsole delivers court feel without compromising impact absorption, say many users. A couple of buyers think that the design of these Adidas basketball shoes is clean and simple. The textile upper of the Adidas Pro Bounce 2018 is very comfortable according to the majority of buyers. Several wearers are happy with how grippy the spiral-like traction pattern is. Because of the Forgefiber on the sides, most Adidas Pro Bounce owners have no issue with containment. According to some, these Adidas shoes are among the lightest high-top basketball shoes they have worn. A handful of Adidas Pro Bounce 2018 users observe that the shoe does not provide enough ankle support. They find the extended collar flimsy. A few say that these Adidas basketball shoes do not provide adequate court feel. The Adidas Pro Bounce 2018 is indeed a great shoe. These high-top basketball shoes have received nothing but good reviews from both ordinary buyers and expert reviewers. As a cherry on top, the Pro Bounce is among that affordable basketball shoes that retail at $120. It is reported that the Crazy Explosives will be replaced by the Pro Bounce in 2018; they will possibly be back in 2019. The Adidas Pro Bounce 2018 was released on September 1, 2018 at $120. 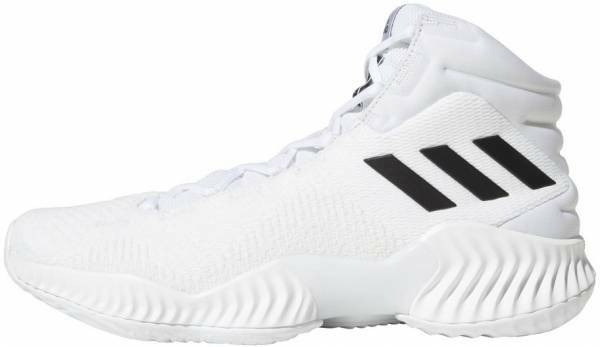 These Adidas basketball shoes feature a textile upper with Geofit and Forgefiber. The Bounce technology in the midsole gives superb comfort and impact absorption. The enhanced traction effectively supports cuts and crosses on the court. Cushion. The Adidas Pro Bounce 2018 features the Bounce cushioning technology. This technology covers the full length of the shoe for maximum comfort and flexibility. The midfoot has a thermo polyurethane shank for stability. Length and Width. Because there are only a few reviews regarding the fit of these high-top basketball shoes, no conclusive pronouncement can be made. New buyers are, therefore, advised to check the shoe’s fit in stores. Lockdown. The Adidas Pro Bounce utilizes the standard lace-up system. To keep the tongue from going to either side, the shoelaces can be made to pass through the tongue loop. Ankle support is provided by the padding in the heel and ankle collar. The Adidas Pro Bounce 2018 comes with the Geofit and Forgefiber technologies in its textile upper. The Forgefiber technology is made of heat-pressed thermo polyurethane-coated fibers stitched on the sides. It helps prevent the foot from slipping out of the footbed. The Geofit technology is the pillow-like pockets in the inner walls of the shoe. The Adidas Pro Bounce 2018 is a high-top basketball shoe that can be worn both on the court and off it. This is best paired with a plain shirt and regular cut pants. Wearing a plain jacket will be a great addition, too. The Three Stripes logo is found at the lateral side and the “Adidas” callout and logo on the tongue. Depending on the colorway, the stitches of the Forgefiber are visible. The Adidas Pro Bounce 2018 comes in different basic colorways. The player exclusive Adidas Pro Bounce 2018 for Andrew Wiggins is bathed in semi solar green, collegiate royal, and dark navy. The hues are reported to be inspired by the maple leaf found in his home country Canada.